The Harris County District Clerk’s website is reporting that there’s a new court date for Cindy. 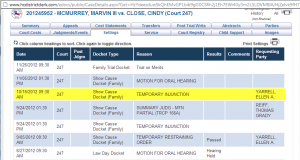 Apparently Ellen A. Yarrell (Marvin McMurrey’s attorney) is seeking a temporary injunction of some sort. This matter is scheduled to be heard at 09:30 on October 16, 2012 in the 247th District Court. On a related note, did you know that most court filings are a matter of public record and are open for your review on the Harris County District Clerk’s website. This link takes you to the Civil/Family tab of the site search, but you can also search other courts by choosing the appropriate tag.